Julie has been at Fleet Feet since October 2012. Julie moved to Davidson with her family in 2007 from Charleston, SC. She has been running since 7th grade track (on a dirt track) at her middle school in Minnesota. Although she has a marketing degree from University of Miami Ohio, her interest leans toward nutrition, exercise and healthy habits. She just recently started nursing school! 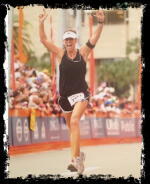 Julie has competed in events from 5ks and sprint triathlons to marathons and a half Ironman. She loves the excitement and training involved in racing, but is thankful for just being able to run whenever she can.